* Qualified statement: Thom(p)son sytled surnames within Clan MacTavish, are those who descend from a MacTavish ancestor, and, who Anglicized or aliased their surname. As ‘Thomas’ derived surnames are extremely prevalent in Scotland, such names have multiple, diverse and storied origins, thusly not all with these names are related to each other whatsoever, or to Clan MacTavish. There was a Thomas, Tom, or Tommy, in nearly every glen in Scotland, making it impossible for all with such Thomas surnames to be related to any single or particular group, family, or clan. For instance, there are Thomsons in the Highland Clan MacThomas, who are not related to Clan MacTavish. There are also Thomsons who originate in the Borders and Lowlands who are not of Celtic/Gaelic stock, and also not related to either Clan MacTavish, or to Clan MacThomas. MacTavish, or the abbreviated McTavish, are only two variations of the name, and are shortenedand modernized spellings of an ancient Irish Gaeilge (Irish Gaelic) name. In Old (ancient) Irish the name of the language is Goídelc . The surname MacTamhais is a Gaelic form of the more modern spelling of MacTavish. MacTamhais is pronounced (heard by the ear) as “Mac Tavis” in the Gaelic of Knapdale. 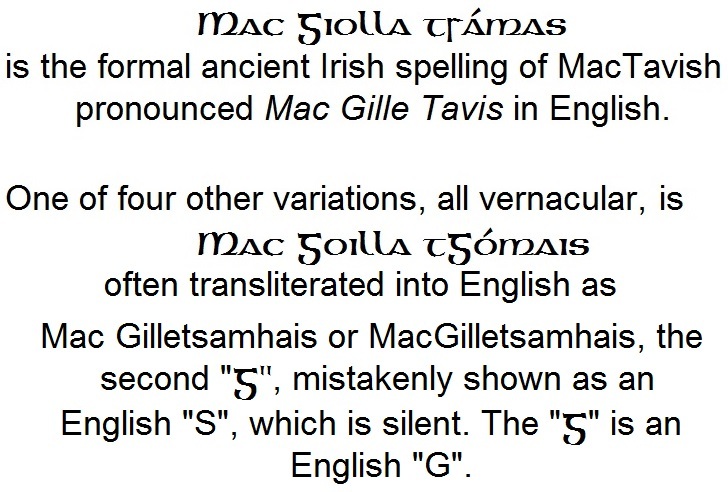 MacTamhais is merely one “era’s spelling” of the name. The old Irish name, shown above translates in English as “Son(s) of the Devotee of Saint Thomas (the Apostle), which carries with it links to the ancient Celtic Church of Ireland and Scotland. Ancestors of the Clan were Abotts of the Holy Island of Iona. History of Clan MacTavish, Thompson. MacTavish is an Anglicized spelling of the Gaelic MacTamhais, while Thom(p)son is the the modern Anglicized alias of MacTavish. 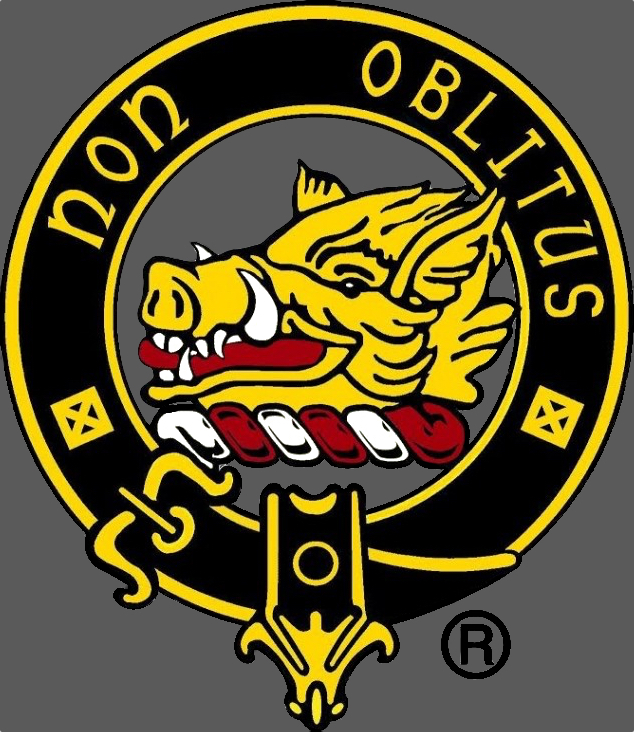 The name of Clan MacTavish in Scottish Highland Gaelic is Clann MacTamhais. Clannad (alternately Clanna) is the plural of Clann. Clannad na Alba means, Clans of Scotland. Bear in mind that not every Thomson or Thompson in the world is a MacTavish, as the names Tammas, Tamhus, Thome, Tome, Tom or Thomas was a very common name form from which surnames are derived. There was virtually a Thomas in every glen of Scotland, so that not all Thomsons and Thompson are related. Clan MacTavish claims those Thomsons or Thompsons who are originally descended from the Dalriadic Argyll MacTavishes, or those who took the name as their own, as they spread out to various regions of Scotland, and have changed their surname to a more gentrified, Latinized or Anglicized version. MacTavish names appear in multiple shires, districts, regions, and jurisdictions of Scotland (and around the world) to this day. In the Highlands, however, the patronymic form of the ancestor or chief was used by the individual to describe himself, even before surnames were a standard form of identification elsewhere. Hence in Clan MacTavish, the use of the literal Mac Tavis or the Gaelic Mac Tamhais, signified who a person was, and from which clan he originated. A person may also have used the estate name upon which he lived to address his identity, but only within his own territory. Outside his locality a person used his Chief’s identifier to proclaim who he was, as he had no surname before the 15th to 16th century. The Gaelic surname transition into Englished or Latinized surnames was taking place in the Scottish Highlands well into the 19th century [modern times], accounting for multiple spelling variations. One variation is MacTawes which is a phonetic of MacTaus (the genitive form). From glen to glen a name could and did change from its true Gaelic form to an altered form. This alteration process has been seen in records for multiple Gaelic names, and often the wild and wholly Mac has been completely omitted. Thus MacTawes/MacTause/MacTaus is simplified or abbreviated as Tawes, Tawis, Tawse, Taus, or Tause; all with their orign in the Gaelic form of Thomas, which is Tavis (relationship identifier > MacTavis). Scottish Gaelic Pronunciation of MacTamhais as used in the Kintyre dialect = Mac Tavis (soft ‘a’ 2nd syllable). In the Knapdale dialect which is pronounced slightly different, the name is heard as Mac Tovis (soft ‘o’ 2nd syllable). The name was commonly spelled MacTamhais, MacThamhais or MacTomhais, alternately spelled MacThamais or MacThomais, in a given era. Consider the Gaelic alphabet is not the English alphabet, and name aliases (such as MacTavish to Thompson) can only be derived from the root source which is originally Aramaic, the word for a twin being te’oma תאומא (ENGLISHED as Thomas). THOMPSON, ‘son of Thom,’ q.v., with intrusive p. This spelling is more commonly found in England. THOMSON, ‘son of Thom,’ q.v. A fairly numerous surname in Scotland. John Thomson “a man of low birth, but approved valour,” was leader of the men of Carrick in Edward Bruce’s war in Ireland in 1318 (Hailes, II, p.102, 206). Adam Thomson appears as lord of Kylnekylle, Ayrshire, c. 1370-80 (Laing, 64). Johannes filius Thome was elected bailie of Aberdeen in 1398 (CRA, p. 374), and John Tomson witnessed a grant in Ayr in 1401 (Friars Ayr, p. 37). Donald Thomson was one of an inquest to determine the rights of pasturage which the Temple lands had over the adjoining town and territory of Letter in 1461 (Strathendrick, p. 223). John Thomsoun was juror on an inquest at Dunipace in 1426 (Cambus, 87), Duncan Thomsone of Auchinhampteris witnessed a bond of manrent in 1491 (SMC, IV, p. 189). Cuthbert Thomasoun witnessed a notarial instrument of 1517 (SoltreI, p. 89), James Tomsone was tenant of the bishop of Glasgow in 1511 (Rental), and Peter Thomsone was Illay Herald in 1561 (ER, XIX, p. 150). “The most conspicuous family of the name were the Thomsons who possessed Duddingston, near Edinburgh, for five generations till sold by Sir Patrick about 1668; his father had been created a baronet in 1636” (Stodart, II p. 140). The surname in these districts is an Anglicized form of Gaelic MacThomais, ‘son of Thomas,’ or of Mac Thomaidh, ‘son of Tommie.” The name is usually spelled MaKcome (3 syllables) in the early records, and was formerly common in Upper Deeside. Alexander Thomeson appears in Strathdee in 1527 (Grant, III, p. 70). John Dow Thomasson in Perthshire fined for resetting Clan Gregor, 1613 (RPC, XIV, p. 632). Tamson 1654, Thomeson 1504, Thomesoune 1477, Thompesoune 1665, Thomsoune 1535, Tomsoun 1567. In some instances it is also an Englishing of MacComie, q.v. See also Thomason. Many of the Argyllshire MacTavishes now make Thomsons of themselves, while others are known as Tawesons. The surnames, MacLehose, and MacLaws, are regarded as corrupted forms of Mac-Gille-Thomais – son of the gille or servant Thomas. There was a strong colony of MacTavishes in Strathglass at an early period. But these repudiate dependency on Clan Campbell, and MacTavish of Dunardry is chief of that clan, whilst Thomson of that Ilk on the Border is regarded as a remotely connected or indeterminate connection to the MacTavishes.
. . . the eldest, Taus Corr *, or Thomas the singular, he was ancestor of the MacTauses, or Thomsons of Argyllshire, and some other parts. The Craignish Manuscript, by Alexander Campbell, Advocate, when consolidating the ancient Q-Gaelic hand-written records of John Campbell, Duke of Argyll. It was later published as The Manuscript History of Craignish, by Herbert Campbell. The text is taken from Herbert Campbell’s p. 256. Note that the Clan MacThomas1, whose chief is MacThomas of Finegand, is not related closely to the MacTavishes, whose chief is MacTavish of Dunardry, in a familial sense, but clearly both MacTavish and MacThomas derive from two varied Gaelic forms of the name Thomas. MacThomas of Finegand does not claim the spelling of Thompson. Both MacTavish and MacThomas are Celtic Highland clans. Many of the Thomsons of Lowland and Border regions are originally from Teutonic roots, and not related to the MacTavishes or MacThomases. Yet there are families of MacTavish and MacThomas who migrated to the Lowlands and Borders at different times and now use an English spelling (alias) sych as Thomson or Thompson, but these are genetically either MacTavishes or MacThomases. Many of these former MacTavish and MacThomas (by name families) are also found outside of Scotland having migrated to England, Wales, North America, New Zealand, Australia, and elsewhere. There were MacTavish ancestors abiding in Dumfriesshire (old Cumbria) as early as the 6th century, and nearly all of them adopted the English spelling. This has been established via Y-DNA testing, showing a Dalriadic (Irish 6th century or earlier) root. The MacTavishes have an ancient Irish origin and name, while many Lowland and Border Thomsons origin is of Teutonic roots, and their name cannot be established prior to the 14th-15th century. The original MacTavish root name (English transliterated as MacGiollatGamhais or MacGiollatSamhais) appears in Ireland as early as the 13th century. 1 http://www.clanmacthomas.org/: “Thomas, a Gaelic speaking Highlander, known as Tomaidh Mor (‘Great Tommy’), from whom the clan takes its name, was a descendant of the Clan Chattan Mackintoshes, his grandfather having been a son of William, 8th Chief of Clan Chattan. Note: Some descendants of the MacThomases and MacTavishes may have intermarried, but otherwise do not appear to be closely related.